For the Balinese, everything is alive with subtle energies interacting with each other in the great unfolding of Life. The tradition emphasizes respecting the subtle energies of life in nature and ourselves and bringing these energies into balance and harmony. At Nirarta you can join in with some of the activities which support this. N.B. Some of the these activities are not open to ladies during menstruation. So please check with Dayu, if this affects you, as we feel it is important to respect the tradition. Price: Normally free – some items have fees. See below. 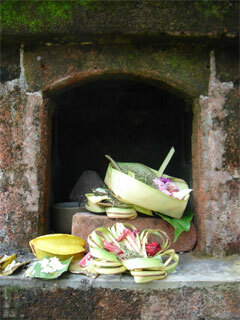 Small offerings are placed daily in our temple, little shrines, on the ground, and where food is cooked, honouring both higher beings of the Spiritual realm and the elemental forces of Nature. special monthly days to honour the different realms of life, such as plants, animals, books and the arts, weapons and cars, etc. 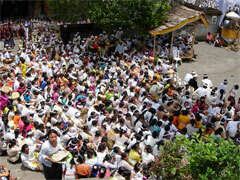 Besides the above, many other vital festival days are celebrated in the course of a year. And every temple, including the family's own temple, has a special anniversary ceremony once or twice a year. All this activity helps to keep the sense that your home, your surroundings, and the Island as a whole is alive, and the different parts of it are in harmony and balance, and we are, too, with each other and our context. When we have a ceremony coming up, you can join Dayu and her helpers to see how they are prepared. You can also learn how to make some of the simpler ‘canang sari’ and learn about their symbolism as expressions of the basic patterns of life. When offerings are in preparation for our own ceremonies or ritual activities, you are welcome to watch or join in, without charge. At other times, a 2-hour session is available on request, with a €10 fee per person for instruction and materials, per 1 – 5 participants. You can join us at prayer in our temple or one of the nearby temples if a festival is in progress. 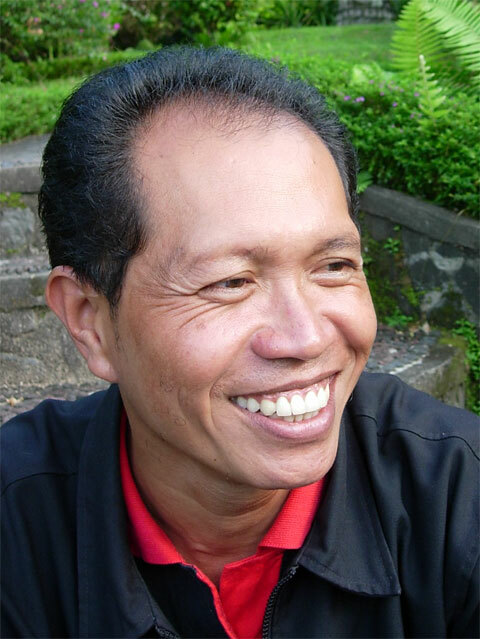 On request, Dayu or one of the staff can teach you the simplest pattern of Balinese prayer and share with you a little of its beautiful and subtle meaning. If your visit coincides with a temple festival or another ceremony, where appropriate, you can accompany us or our staff to enjoy a taste of how these activities contribute to the social and spiritual cohesion of the island. 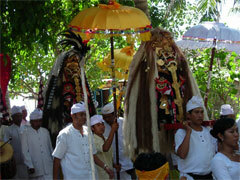 No charges apply for attending local ceremonies, when invited by ourselves or Nirarta staff. 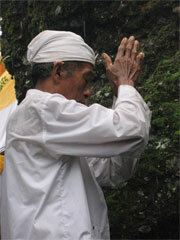 From time to time, the Balinese may visit a High Priest for a cleansing blessing, called 'Melukat'. If you would like to experience this, please let us know, as we will need to let the high priest know and prepare some offerings for you. It is also possible to visit the High Priest's home and receive a simpler holy water blessing. (Charges include transport, donation, offering basket, and English speaking guide). 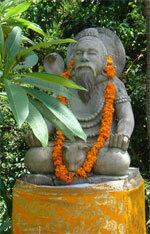 Charges: A number of these temples are included in our guided walks and tours. Other destinations can be arranged on request. Charges for transport, offerings, and guide will apply. 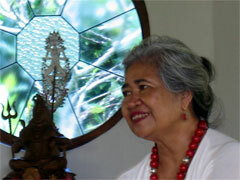 For the Balinese outward actions are the expressions and reflections of inner meaning. Many Balinese will thus visit particular shrines or temples when they receive the impulse or inspiration to do so, as a way of saying ‘thank you’ or of asking for blessings from the manifestation of the divine connected with a particular spot. Many of these temples and shrines are in natural settings, on hills, mountains or beside the sea in locations, where the energy of nature feels divine in nature. Some, but not all, of these temples are in quite remote locations and may require a lengthy hike, or something of a climb up many steps. If you would like to visit one or more temples, we can arrange this with you, choosing a place, which will reflect the kind of energy you seek. Faced with health disturbances which prove intractable or appear to have non-physical causes, or to require expensive treatment beyond the family’s resources, many Balinese still visit traditional healers for a variety of treatments – herbal, spiritual or ritual guidance, bone-setting, energy balancing, trance mediumship, and so on. 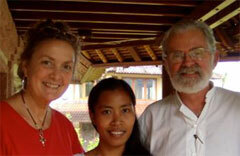 On request, we are able to arrange visits to a number of traditional Balinese healers. Choice of healer will depend on what kind of help you are looking for. These visits will generally require driving an hour or more from Sidemen. For the above activities, you will generally need to wear a sarong and a sash. If you don’t already possess these, we can help you purchase them in Sidemen or we may have something you can hire for the occasion. Charges: Cost of transportation, offerings, guide, and any fees vary according to the healer requested. We will supply a quote on request.